One of the most amazing gastronomic experiences I have had during my time on the cruise while on the beautiful Britannia, was at the Epicurean restaurant, a fine dining restaurant found on Deck 16. While there is no celebrity chef associated with the restaurant, the food is exemplary and of such high quality standard that you would almost believe there had to be a famous chef at the helm of the restaurant. The venue is fabulous and grand, with luxe details and elegant decor. We were given a lovely corner table and we sat down excited at what was to come. Karen, an award winning food writer (pictured to the right) whose blog is the fabulous Lavender and Lovage, had dined at the Epicurean restaurant the year before on Britannia’s maiden voyage and had given us some lovely details of what to expect. It was mine, Amanda (pictured left) from Glamorous Glutton, and Amit’s first time eating here. While we contemplated what to order from the menu, we started off with some sparkling wines, which were refreshing and delicious and much needed after a hot day in the Spanish sunshine. Having spent the day in Barcelona, and visiting the Boqueria and marvelling at all the amazing Jamon iberico available, I was so excited to see they had Jamon Pata Negra Iberico de Bellota on the menu as a starter. Amanda and I opted for this and were delighted that it was hand carved at our table, and served beautifully with mature Manchego Cheese, Olives and Country bread. It was scrumptious. Amit opted for the Buttered Green and White Asparagus, which was served with a crisp deep fried egg, bacon, ham and pancetta. He really enjoyed his stater and thought all the components complimented each other really well. He isn’t one that usually goes for Asparagus and he was very pleasantly surprised. For mains, I went for the Fondue of Whipped Brie with Hibiscus and Sun-dried Cranberry Tisane. It was served with Smoked New Potatoes, Pickled Shallots, Walnuts, Bee Pollen Tuiles and Rose Hip Jam. It was presented beautifully and it was just spectacular. All the ingredients were ones that I love so it was a dream main dish! Karen went for the Whole Dover Sole a la Meuniere, which was prepared by our table, and she really enjoyed it. It was served with Baby Vegetables and Potatoes. It was such a pretty plate! Amit went for the Dup of Duck Specialities, which was an Oriental Confit Duck Leg Spring Roll and a Pan Seared Duck Beast, Seared Melon, Parsnip Puree and a Sour Cherry Jus. He thoroughly enjoyed this dish. In between our mains and dessert, we were served palate cleansers which were a sorbet disguised as a lipstick for the ladies, and a poached egg yolk made from mango and coconut milk for the gentleman on our table. Dessert was a fantastic theatrical affair which involved a blow torch and spheres! I went for the Creme Brûlée and White Chocolate Sphere. This was filled with Raspberry Pearls, Chocolate, Candy Floss and Caramelised Popcorn – such a fun and delicious dessert! The entire meal was classy, fun and inventive all in one and we all thoroughly enjoyed every single course. 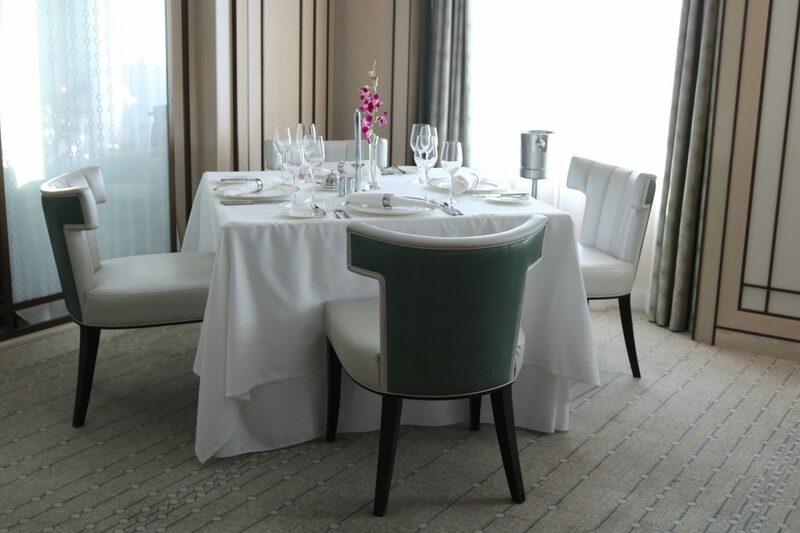 If you are planning to go on a cruise with P&O Cruises and they have an Epicurean restaurant on board, I would definitely recommend dining there as it is a very lovely and memorable food experience. Previous Post I have some exciting travel plans to share…. It all looks so tasty! I love Spanish food too. I’m a fan of Karen, how awesome for you to have dined with her!